Delaware 299 overlays U.S. 301 (Middletown Warwick Road) from just east of Warwick, Maryland to Main Street in Middletown. Main Street takes the route east through Downtown and suburban areas annexed to the east. Middletown Odessa Road continues Delaware 299 to an interchange with Delaware 1 (Korean War Veterans Memorial Highway) and Main Street through Historic Odessa. The route concludes southeast of the Appoquinimink River at semi rural Mathews Corner. Construction for the U.S. 301 Toll road around Middletown realigned Delaware 299 (Warwick Road) onto a frontage road leading north from the Maryland line. Running along the west side of the expressway, Delaware 299 hooks into an a diamond interchange with U.S. 301 and an extension of Levels Road. A two year project anticipated to begin in 2019 will improve capacity along Delaware 299 in Middletown. Expansion widens the state route into a five-lane boulevard with a continuous center turn lane from Catherine Street to Cleaver Farm Road, and a four-lane divided arterial from Cleaver Farm Road to Delaware 1. 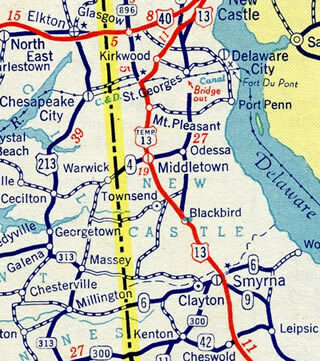 The east-west route from the state line near Warwick, Maryland to Middletown and Odessa was designated as Delaware 4 by 1938. Maryland 299 south through Warwick to Massey was established by 1942. 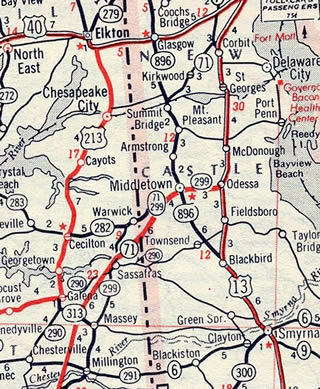 Mid-1950s construction of Maryland 71 from U.S. 50 at Queenstown to the Delaware state line by Warwick, coincided with the renumbering of Delaware 4 east to Odessa as Delaware 299 in 1957. The 1959 extension of Delaware 9 north to Wilmington also included lengthening Delaware 299 east from Downtown Odessa to Mathews Corner. Delaware 71 was realigned to form a multi state route with Maryland 71 as U.S. 301 was extended to Delaware in 1960. Sassafras Road was subsequently decommissioned as Maryland 299 between the new U.S. 301 and Cecilton Warwick Road (Maryland 282). Maryland 299 east through Warwick was renumbered as an extension of Maryland 282, creating a numbering anomally with Delaware 299. Within the First State, U.S. 301 separated into north and south branches between Middletown and Tybouts Corner. U.S. 301 North overlapped with Delaware 299 east to Middletown until 1971. Delaware 71 was dropped from its overlap with U.S. 301 and Delaware 299 southwest from Middletown after 1984. Delaware 15 was added along both routes from Levels Road to Bunker Hill Road in 1993. Construction of the new arterial bypass for U.S. 301 west of Peterson Road reconfigured Middletown Warwick Road, Main Street and Bunker Hill Road into a new intersection by the following year. Delaware 299 (Warwick Road) takes over for Maryland 282 (Main Street) east from the state line along a rural stretch outside the Middletown limits. Photo taken 12/29/17. The 2017 realignment of SR 299 shifts the state route northward from its previous intersection with U.S. 301, located by this reassurance marker, toward Middle Neck Road. Photo taken 12/29/17. SR 299 (Warwick Road) parallels the southbound lanes of U.S. 301 to Middle Neck Road. Middle Neck Road angles northwest to agricultural areas outside the Middletown city limits. Photo taken 12/29/17. The third shield for SR 299 east stands beyond the intersection with Middle Neck Road. Photo taken 12/29/17. The diamond interchange with the U.S. 301 toll road comes into view as Warwick Road makes a broad turn to the southeast. Photo taken 12/29/17. The U.S. 301 toll road will use all electronic toll (AET) collection with E-Zpass transponders or pay-by-plate. Photo taken 12/29/17. Continuing from the east side ramps with U.S. 301, SR 299 (Warwick Road) approaches Middletown Warwick Road and SR 15 (Levels Road). Photo taken 12/29/17. Delaware 15 (Levels Road) follows Levels Road south to Charles E. Price Memorial Park and Dogtown Road to the west of Townsend. Photo taken 12/29/17. Delaware 15 north combines with Delaware 299 east along Middletown Warwick Road (old U.S. 301) toward central Middletown. Photo taken 12/29/17. Delaware 15 comprises a rural route connecting Middletown with Clayton in Kent County. Northward, Delaware 15 & 299 (Middletown Warwick Road) overlap for 1.25 miles to West Main Street. Photo taken 12/29/17. SR 15 north & 299 east advance northeast along a commercialized stretch lined with restaurants, big box retail and gas stations. The first of three shields for the overlap stands east of Levels Road. Photo taken 12/16/17. Merrimac Avenue constitutes a four-lane boulevard south to an area of warehouses and distribution centers and north through the Westown retail area to the Parkway development. Photo taken 12/16/17. SR 15 north & 299 (Middletown Warwick Road) east continue by Westown center into central Middletown. Photo taken 12/16/17. South Ridge Avenue connects SR 15/299 (Middletown Warwick Road) with additional retail and the Parkway community. Photo taken 12/16/17. Delaware 15 turns west along Bunker Hill Road from Delaware 299 and Middletown Warwick Road (old U.S. 301) at West Main Street. Bunker Hill Road spans the U.S. 301 toll road west to Choptank Road. Photo taken 12/16/17. Delaware 299 follows Main Street east from Delaware 15 and Middletown Warwick Road through Downtown Middletown. Photo taken 12/16/17. West Main Street narrows from four to two lanes just east of Middletown Warwick Road (old U.S. 301) and this confirming marker for Delaware 299. Photo taken 12/16/17. U.S. 13 separates into a one-way couplet of 6th and 5th Streets through Odessa. Delaware 299 (Main Street) east intersects U.S. 13 north ahead of the historic district. Photo taken 01/15/17. Main Street expands to include on-street parking as SR 299 leads away from U.S. 13 (5th Street) north. Photo taken 01/15/17. Main Street east at 2nd Street. SR 299 makes an S-curve beyond Front Street to leave Downtown. Photo taken 01/15/17. Crossing the Appoquinimink River, Delaware 299 lowers across an area of wetlands by the Odessa Access Area. Photos taken 01/15/17. Old State Road curves southward between the Appoquin Farms subdivisions to Taylors Bridge Road. Delaware 299 turns east while Old State Road loops west to U.S. 13 (Dupont Parkway). Photo taken 01/15/17. Taylors Bridge Road links Delaware 299 east with Delaware 9 (Thomas Landing Road), 0.18 miles to the east. Photo taken 01/15/17. Delaware 9 straddles coastal areas of New Castle County southward from Reedy Point Bridge to Flemings Landing and Kent County. The state route also serves several subdivisions built to the east of Odessa and Fieldsboro. Photo taken 01/15/17. An end shield marks the conclusion of Delaware 299 by the Silver Hill Farms neighborhood. Photo taken 01/15/17. A historical look at an older shield style for the Delaware 299 eastern terminus. Photo taken 12/21/01. SR 299 west and SR 15 south overlap for 1.22 miles from West Main Street to Warwick Road along Middletown Warwick Road (old U.S. 301). Photo taken 12/15/17. Mileage sign posted for SR 299 west to Warwick and U.S. 301 south to Annapolis via the Chesapeake Bay Bridge (U.S. 50). Photo taken 12/15/17. South Ridge Avenue connects SR 15/299 (Middletown Warwick Road) with adjacent retail and the Parkway development. Diamond State Boulevard ties in from additional big box stores to the east. Photo taken 12/15/17. Reassurance markers for SR 15 south & 299 west posted by Westown retail plaza. Photo taken 12/15/17. The succeeding traffic light along Middletown Warwick Road southbound is with Merrimac Avenue north to the Parkway development and south to Industrial Road. Photo taken 12/15/17. A final set of shields for the SR 15/299 overlap stand west of Merrimac Avenue by additional areas of Westown center. Photo taken 12/15/17. SR 15 south and SR 299 west part ways with old U.S. 301 (Middletown Warwick Road) for Levels Road and Warwick Road respectively. Photo taken 12/15/17. SR 299 branches northwest from SR 15 (Levels Road) and Middletown Warwick Road (old U.S. 301) to cross over the U.S. 301 toll road. Photo taken 12/15/17. A diamond interchange (Exit 2) joins SR 299 with the U.S. 301 toll road. Upon completion in January 2019, the toll road will bypass Middletown to the west en route to SR 1 at Biddles Corner. Photo taken 12/15/17. SR 299 (Warwick Road) curves southwest to run along the west side of U.S. 301 toward the Maryland state line. Photo taken 12/15/17. Middle Neck Road ties into SR 299 (Warwick Road) from Cecil County, Maryland ahead of this shield assembly. Photo taken 12/15/17. Rejoining the original alignment of Warwick Road, SR 299 leads away from U.S. 301 one mile to unincorporated Warwick. The town of Cecil follows in five miles at MD 213. Photo taken 12/15/17. The last reassurance marker for SR 299 westbound. Photo taken 12/15/17. Maryland 282 commences a 12.43 mile route west from Delaware 299 to Cecilton and Crystal Beach. Photo taken 08/10/04.